First, you spend too much on a new graphics card. Then, you fire up your chewiest, toughest PC games and make them beg for mercy. For one brief moment, your exorbitant purchase feels completely reasonable. Any time I install a new PC component, particularly a new GPU, I have a short list of games that I check out first. Which games have been giving me trouble? Which will best justify my purchase? How high can I get the little frame-rate counter in the corner of the screen to climb? Of course I had to play The Witcher 3 first. Not only is it one of my favorite games, it’s one of the best-looking games I’ve got. It already ran fine in 1440p, but I wanted it to run finer. And it does; oh, it does. I would say that Geralt is like 10% more ruggedly handsome than he was. I’m not quite sure how to benchmark that. At its best, RotTR is as pretty as anything else I have installed. Also a game that gave my last video card a run for its money. I’ve beaten it twice (!!) which seems like more hours than I’d expected to spend playing it, so I fired it up just long enough to run around the Geothermal Valley and determine that I do indeed get a good frame-rate. Onward! There’s always that one game, isn’t there? The one game that still doesn’t run well, and you assume it’s that the game isn’t well optimized but you can never be quite sure. I really like the new Hitman, but it has never run very well for me. I’ve tried everything (seriously, everything) and I cannot keep it above 60fps. Guess what? I still can’t keep it above 60fps on my GTX 1080. (I know it’s a CPU hog, but if a 4.4Ghz i7 can’t keep up, something’s off.) If you’re bummed out about your Hitman performance and are worried that your PC is the problem, don’t be. I’m gonna go out on a limb and say that this game is simply poorly optimized. And if you’re lucky enough to have a PC that can run the game perfectly, well, good for you. 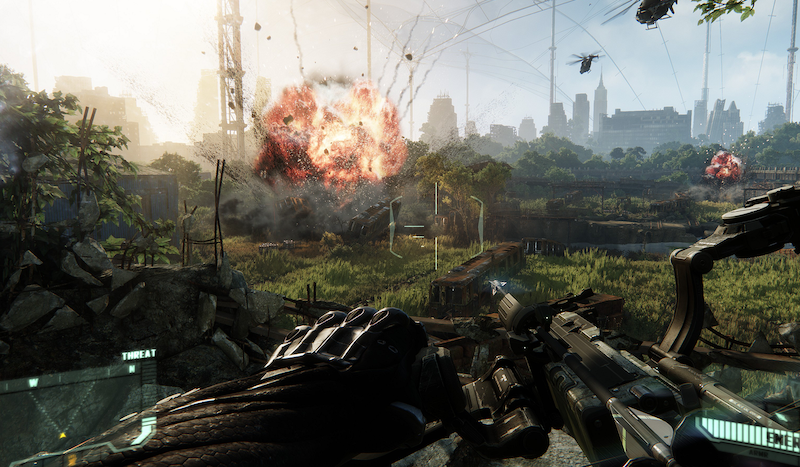 Ah, Crysis 3. A game I’ve never really cared for, but keep around specifically to throw under the wheels of new graphics cards. I don’t really need to play for very long, I just want to look at Psycho’s beautiful, pockmarked face, then to go choke out some dumb CELL agents. This game is showing its age in some respects, but my 980Ti actually had a little trouble with it at 1440p. It’s gratifying to see a new GPU chew it up and spit it out. Maybe my next card will run it in 4k. This is a new one for me; in the past I might’ve put Arkham Knight or Just Cause 3 here. But now that I’m actually actively playing VR games, I want to be sure they’re running nice and smooth. Elite: Dangerous is generally really good in VR, but my PC has always had trouble keeping it at 90fps. Until now, I guess. The 1080 is finally able to play this game at the VR frame-rate John Carmack intended, and it looks very fine, indeed. And there they are, the first five games I used to test out this latest GPU. (If you want full benchmarks and all that, go check out Mike’s review.) Everyone has their own first games they play on new hardware—surely some of you still break out the original Crysis for old times’ sake? Share yours below.